Note: there are no spoilers for Captain Marvel in this post. Last night was a fun night with Marco and Roger. First off, we watched the Ajax-Real Madrid Champions League football game. Amsterdam’s Ajax team lost the previous match against Real Madrid 2-1 so they needed to win by at least two goals last night to proceed to the quarter finals. And that they did – winning 4-1! The coolest goal was the last one Ajax made (YouTube). The best part about the game was that it started at 9pm and ended around 11pm. Which was really good for us, since after that we were going to a midnight showing of Captain Marvel. Generally movies premiere on Wednesdays in the Netherlands, and since 12:01am is also Wednesday… yeah. Fun thing: I noticed that the movie theatre had ruby chocolate KitKats. If you’ve never tried ruby chocolate, you should. It is a bit sour, but still sweet like chocolate. The movie was pretty good. I liked it and was definitely entertained even though I was sleep deprived. I thought the cat stole the show. More about the cat here, with a few minor spoilers if you don’t read the Captain Marvel comics. And lastly: of course there is a Stan Lee tribute. The theatre clapped for that. 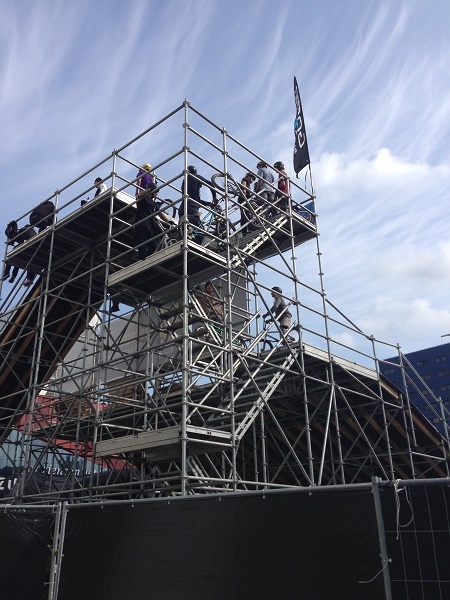 This year the race ended in The Hague, so the city made it part of Scheveningen’s Feest aan Zee (Seaside Celebrations). This annual programme marks the 200th anniversary of Scheveningen’s founding. Of course – it is called football (or voetbal) over here. Roger bought some tickets for the ADO Den Haag game a few weeks back, against Sparta Rotterdam. So Marco and I met up with Roger and his mother – although our first stop was the Rrrollend Foodtruck festival. The last one of the year in The Hague! We are already looking forward to the return of the festival in 2018. Here is the ADO Den Haag stadium – reachable by tram 3 or 4 from the city centre (Forepark station). Unfortunately it is about a 10 minute walk from the station, but at least you don’t have to take the train. 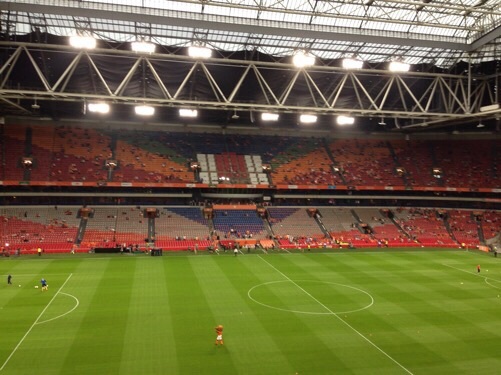 Before the game – people filing in and the grass being watered. It is hard to tell from this photo, but the seats are elevated, with fans needing to climb a flight of metal stairs to get to this level. The field is separated by a high wall to prevent rioters from reaching the field. The section on the other side with the team logo is where the fans with season cards sit. At the beginning of the game they passed out a lot of large flags to our section. If you sit here your flag waving skills better be good! Above is one very energetic fan. He first passed this flag to another spectator, asking if the man wanted to wave the flag. When this didn’t really happen (the guy just held it in his hands), the guy took it back and began to wave it frantically. And note the back of his shirt – 070 is the area code of The Hague. We ended up winning the game 1-0. It would have been 2-0 but there was a goal called off for being offside. The best part: we were sitting right behind the goal so we had a great view. Here’s a look at the graffiti-filled wall that separates the fans from the field. The stairs to go up to the stands are off to the left. All in all it was a fun game. Though I have to admit that my favorite moment was when ADO Den Haag had a goal chance that the Sparta goalkeeper blocked – four times! The ball kept being hit back to the ADO Den Haag player, who had little choice but to kick it back in the same direction. it was like a game of pong. Guess what I am currently doing at 12:11 am? Watching the Super Bowl on our Apple TV via the CBS sports app! The best part is that it is through CBS so you get access to the commercials as well. For a few years we had an NHL app and the commercials were blocked on there due to it being shown internationally. 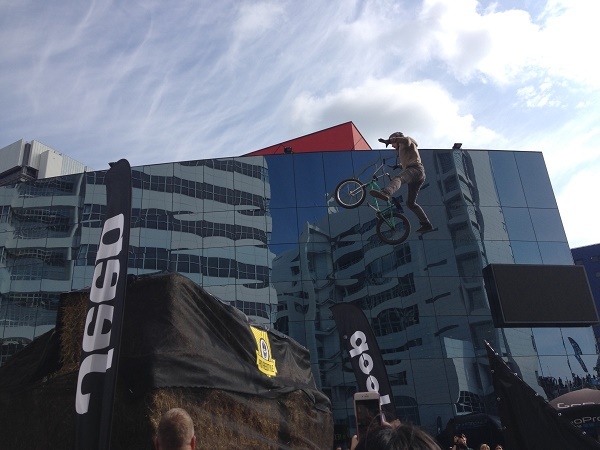 Last Sunday Marco and I came across the Pro Freestyle event being held at the Spuiplein. 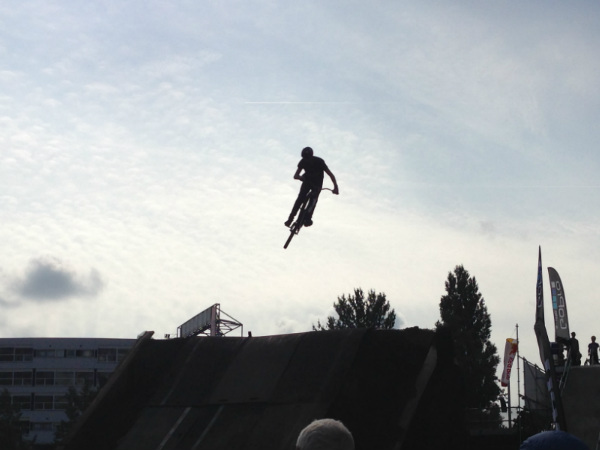 The three day event attracted about 35,000 visitors and featured freestyle BMX, skateboarding and more. Once you’re done with your run you have to carry your bike up the stairs and do it all over again. Bonus: the awesome sky. So while Marco and I were at Roger’s we happened to check Teletext (a television information retrieval service). Imagine our surprise when we saw that Ado Den Haag won their game 4-1. Not surprised that they won per se, but surprised that this meant the football team was at the top of the standings for the Eredivisie (“Honor Division”, the highest Dutch football league). 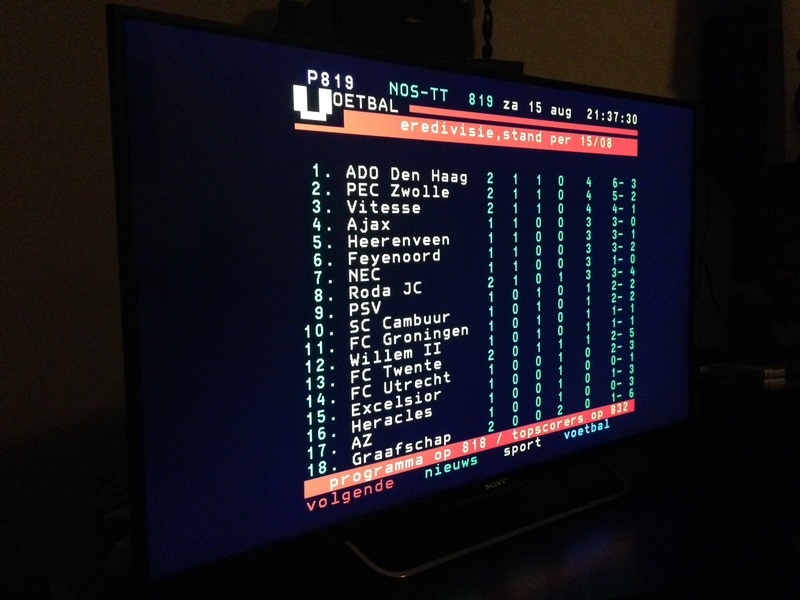 Of course the standings were recalibrated a few minutes later to include Ajax’s win, but for a few minutes there we were on the top of the world! Quick. Name one thing you do NOT mess with in the Netherlands. …if you guessed football you would be correct. In most if not all European countries, football is the sport. Fans eat, sleep and breathe football. Sometimes viewing multiple games on multiple devices (television, smart phone, tablet…) at the same time. It is a way of life. Unfortunately you can expect issues if you try to get in the way of that. Even if you’re the police. The police have been striking at various times over the least few months. I wrote about it back in May when 1,500 police officers protested around the Binnenhof. Of course it makes sense – they just want better pay. It’s not that much different from the farmers striking in Belgium and France by driving really slow on highways and obstructing traffic. Now ADO fans have a plan of their own. 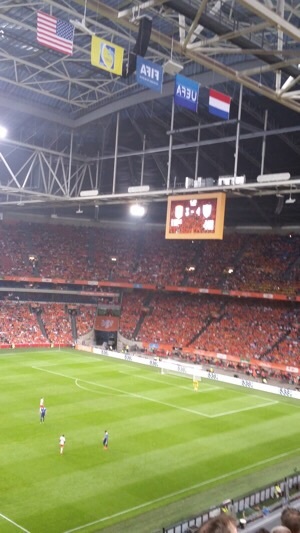 ‘Wij geen wedstrijd, hun geen staking‘ which translates to “No game for us? 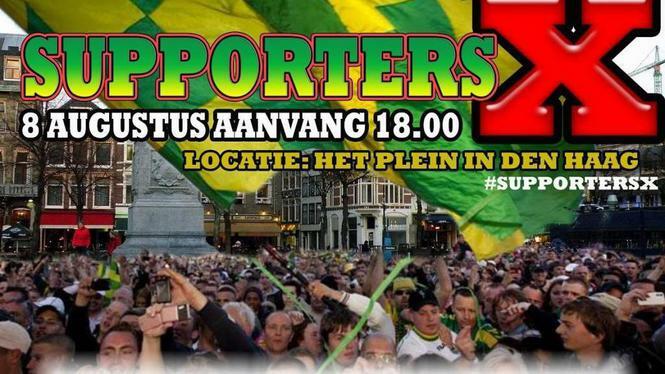 No strike for them.” The plan is to have as many people as possible meet at the Plein in The Hague at the scheduled time of the game. A large group of people would require a similarly large police presence, which means that at least some of the police cannot strike during their planned strike time. It is an interesting tactic if you think about it! Friday night I went with a small group (Marco, Roger and Roger’s mom) to an exhibition football (soccer) game. 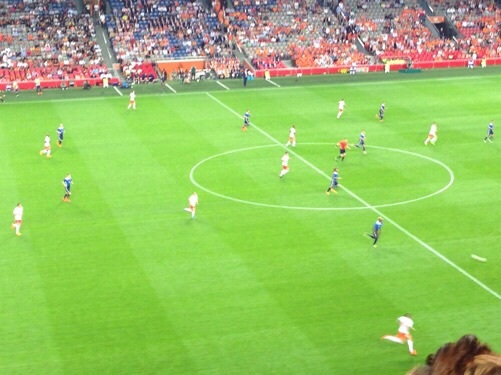 The game was between the U.S. and the Netherlands and held at the Amsterdam ArenA. No, the last A is not a typo! A note about the above picture. It looks like a flyer but if you look very closely you can see lines, each about an inch or an inch and a half apart, where it can be folded. It is a pretty thick cardboard, so when it is folded it becomes a very thin but powerful noisemaker. You smack it against your hand instead of clapping. And there was one at every single seat. Thanks to the stadium’s acoustics it is LOUD. Unfortunately it is nowhere near as powerful outside the stadium! 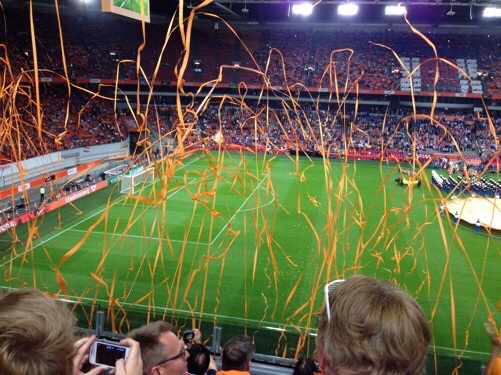 You can see the football in the bottom right (the white streak) as the Dutch advance. About 2 seconds later they scored to go ahead 2-1. Marco said it was because the American national team’s coach is from Germany and he was a great forward in the 1990’s. The Germans have a habit for coming back from behind at the end of the game. Regardless, it was definitely a fun experience. 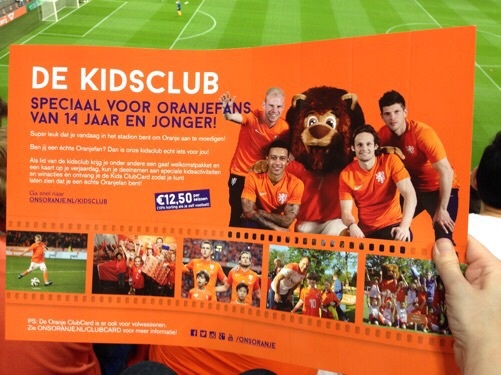 The game between the Netherlands and Chile was closer than the score would show – the first Dutch goal was in the 77th minute by Leroy Fer and the second one was in extra time by Memphis Depay. With this win, the Dutch take first place in their group (B) and play again Sunday at 6PM local time. 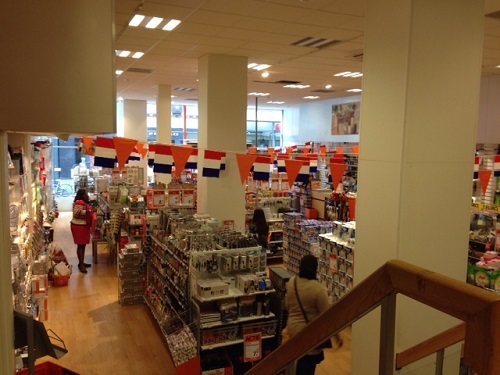 Go Dutchies!